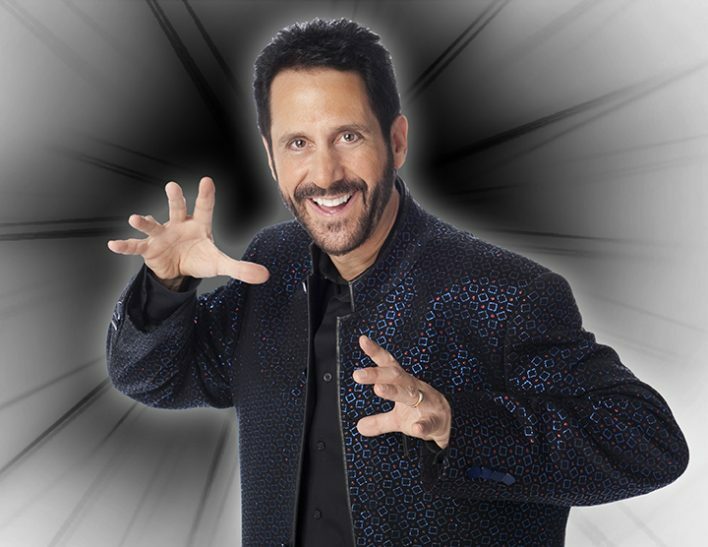 On February 23, 2018, Dollars 4 Tic Scholars is proud to bring to the stage the incredible Master Illusionist, Gary Goodman! Gary will delight our audience at Triple Threat! 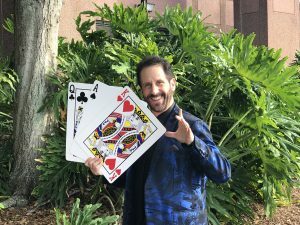 A Captivating Evening of Comedy, Mind Games and Magic with Gary Goodman to be held at 6:30pm at the South County Civic Center, Delray Beach, FL. We were wondering – what makes Gary tick – (not tic 🙂 ) and how did he begin to hone his craft so well that he has thrilled audiences around the country? Gary performs at Fortune 500 events, college campuses, schools private parties and on board the Disney “Magic” ship. He’s performed at the Chris Evert Pro Celebrity Tennis Tournament Half Time, and for Chevy Chase, Celine Dion and Adam Sandler. We did a Q&A with Gary – read on to meet our amazing performer! D4TS: What appealed to you about performing for the Dollars 4 Tic Scholars fundraiser? Gary: I am always interested in working with any organization that is helping students in need of a college education. I am honored to be part of an organization that is raising money to help with scholarships for young adults with the challenges they face with Tourette Syndrome. D4TS: Can you give us a hint about what types of illusions the audience can expect? Gary: My show combines many elements in the world of magic. I will perform a show that will provide lots of laughter, mystery and mind-boggling mentalism. I also have a great illusion I will perform as my finale for this very special magical evening. I don’t reveal any more about my show because part of the fun of a Magic and Mind Reading Show is the element of surprise. D4TS: What’s your favorite thing about doing magic for a cause like Dollars 4 Tic Scholars? Gary: I enjoy knowing that the effort we are all providing for this cause is hopefully going to enable children with Tourette Syndrome to afford college and monies raised will help children enjoy the special camp designed for children with Tourette’s. D4TS: How did you get started in magic? And how old were you? Gary: I became interested in magic after my father introduced me to my first magic shop at the age of 7 in Toronto, Canada. I then discovered the Houdini Museum was in Niagara Falls Ontario. I grew up in Niagara Falls so it was close to my home which enabled me to visit and study the Great Houdini. My parents also hired a magician for my 8th birthday party. At the age of twelve I began performing my own show at private parties. 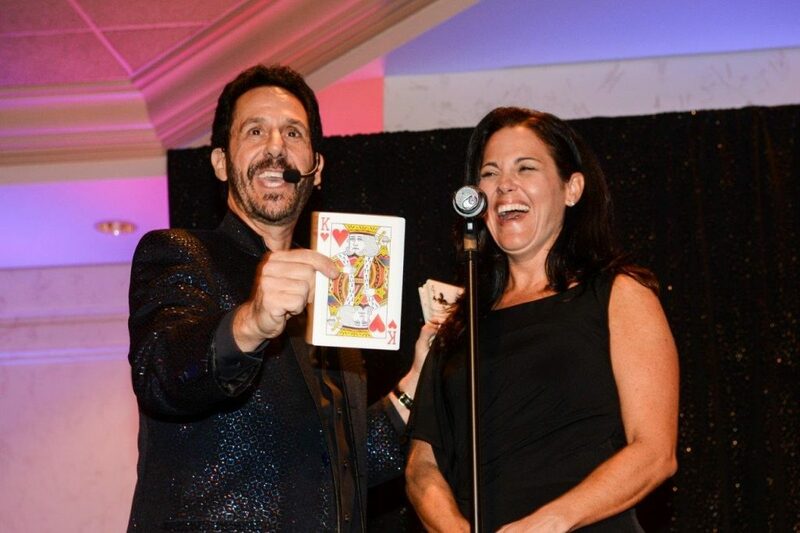 D4TS: What’s your favorite part of a magic show? Gary: Feeling the excitement in an audience and hearing the laughter. D4TS: There must be an art to combining comedy, magic and mind reading in your show…what makes it work? Gary: The design of my show is from 47 years of learning what amazes an audience and then knowing what order to perform these effects. D4TS: What does your family think of your talent? Gary: I grew up in a show business family so everyone was very supportive. My mother was a professional singer and dancer and my father played drums in bands and orchestras his entire life. They both were part of many shows and productions and knew the secrets to entertaining an audience. They shared a lot of their knowledge with me and took me to see all the great entertainers who came to town. Gary recently authored his bestselling book, “Magic Tricks To Fool Your Friends”. Receiving rave reviews, the book teaches YOU easy to learn magic tricks that you can use to fool friends and coworkers, including how to levitate in mid-air! You can find out more about Gary and his highly acclaimed performances at: www.GaryGoodman.com. Stay tuned for Part 2 of “Getting to Know Gary”, coming soon! And don’t forget to register for Triple Threat right here – it will be Magical!